LG 4K TV owners can now rent Dolby Atmos and Vision films | What Hi-Fi? A partnership between LG, Rakuten TV and Dolby has brought Dolby Vision HDR and Dolby Atmos movies to Rakuten’s film rental service. 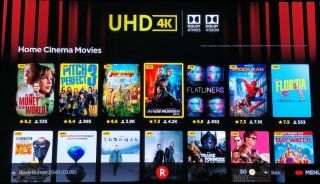 While films with Dolby Atmos or Dolby Vision (or both) have been offered by TV services such as Netflix, iTunes and Sky for some time, it hasn't been possible to rent or buy 4K films with either of the two technologies directly on a TV. That’s no longer the case, as Rakuten has teamed-up with LG and Dolby to bring a number of Dolby titles to its film rental and purchase service. However, they are only available to owners of LG's OLED TVs from 2017 and 2018, and this year's SUHD TVs. The Dolby titles can be found in a ‘Home Cinema’ section of the Rakuten interface, and include recently released blockbusters – we enjoyed a demo of Blade Runner 2049 and Baby Driver – as well as older titles, such as Bad Boys II and The Amazing Spider-Man. Dolby titles are priced similarly to the service’s 4K HDR10 films, making newer releases around £5 to rent and £10 to buy - although pricing does vary slightly depending on the film. The partnership isn’t exclusive so, while only certain LG TV owners can currently benefit, we may see more TV manufacturers getting onboard. After all, the Rakuten TV app is ubiquitous, and Sony, Philips, B&O, Toshiba and Loewe have all supported the Dolby Vision HDR format. The news follows Rakuten’s recent announcement that it will upgrade already-purchased Full HD films to the 4K HDR versions for free – a policy also adopted by iTunes.